Like most players on contending teams, Joe Pavelski enjoys this time of the year. Somehow he rises to the occasion. At 79 points, the Sharks aren't guaranteed anything just yet. That's why Pavekski and Co. are playing close to playoff level hockey, even against a team like the Blackhawks, who have a slightly different agenda the rest of the season. "It's about execution and getting your chances," Pavelski said. "When you can score on those it goes a long way. It was a fun night. Not all of them will be like that." 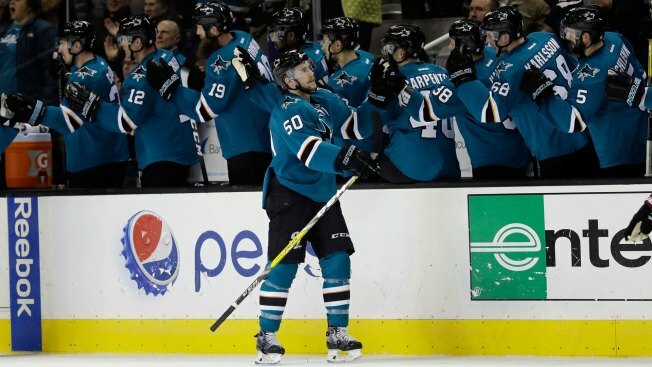 Logan Couture, Timo Meier, Kevin LaBanc, Marc-Edouard Vlasic and Barclay Goodrow also scored for the Sharks, who won their second straight at home after dropping three in a row on the road. Artem Anisimov and Nick Schmaltz scored for the Blackhawks, who lost their seventh straight road game while allowing their most goals this season, matching the seven New Jersey scored on Nov. 12. "Not good. It was tough," Chicago coach Joel Quenneville said. "You try to do things right but I don't think we did too much in the 'right' department all game long. We didn't manage the puck at all." Martin Jones stopped 32 shots for San Jose. J-F Berube gave up six goals on 28 shots through the second period before he was pulled. Anton Forsberg allowed a goal in the first three minutes of the third period. "I can't say anybody had a great night, so you can't talk about one guy," Quenneville said. "We gave up too many high quality shots off the rush." Anisimov gave Chicago a 1-0 lead in the third minute of play, the result of crisp passing from both Duncan Keith and Patrick Kane. Pavelski tied it midway through the first period, taking a short pass from Brent Burns and burying it into the net. Couture scored four minutes later and the rout was on. "It was one of those nights the puck was going in," Pavelski said. It's good to see guys who do it the right way step up abd get rewarded." The sixth goal came with two seconds left in the second. Berube caught the puck but couldn't hang on. Vlasic came around and fired a shot off the back of Berube's pads and into the net. "We haven't scored like this all season," DeBoer said. "It's nice to have a game like this, to put some pucks into the net." Jones blocked Anthony Duclair's penalty shot with five minutes left to play. Schmaltz scored in the final minute.